It’s always a very exciting prospect when Royal Enfield launches a new flagship. The smallish Chennai based company has been churning out a steady stream of motorcycles almost since the days of the Raj and if anyone was to look at the kind of bikes the company made then and what’s rolling out of the factory gates right now, they might be forgiven for thinking little has changed in over the last five decades or so. But they’d be dead wrong. Classically styled and nostalgia fuelled they might be, but the boffins at Royal Enfield have slowly, but steadily, modernising the motorcycles they make, at this juncture they probably offer a very interesting mix of old world and new in a way nobody has really done so far. The last big jump we saw what the appropriately named Classic 500 – a bike that looks like a 1950s Bullet, but is powered by a modern aluminium-block 500cc electronic fuel injected engine which shot to flagship status in the company’s line-up. And we absolutely loved it in every way. So you can imagine then that when RE announced that a new flagship was coming out in the form of the Thunderbird, it left us a little stumped. Let me get this one fact out of the way. I’m not what you might call an ‘Enfield-guy’, but I’ve had the opportunity of clocking a few thousand kilometres on the older Twinspark 350cc Thunderbird during the 2009 Royal Enfield Himalayan Odyssey. While the bike certainly managed to impress me, it still wasn’t the quintessential ‘Enfield’ for me, and that slot always belonged to bikes like the Machismo (LB) 500 and more recently the Classic/Desert Storm 500. And I absolutely adore these bikes, so it was with natural scepticism that I approached this new Thunderbird 500. In the way it looks that is. While an average Joe might have difficulties distinguishing an RE Classic from a Standard, there is no mistaking this new Thunderbird 500 for anything else on the road. Now everyone, including myself, had first seen the T-bird 500 in January this year at the 2012 Auto Expo in Delhi, and based on that I had already formed an opinion on the way it looks. Let’s just say that it wasn’t a very positive one. But after seeing the bike standing in front of me in our office parking, I realised that I mustn’t have seen the bike at the Expo very properly and how wrong my opinion had been so far. The bike is absolutely striking any way you look at it. While the overall proportions of the original Thunderbird (which has been around for the last 10 years by the way) have been maintained, the new bike is full of little changes, both aesthetic and technical that gives it a very different aura. In an unfaired bike, the engine is a standout member of the design and forms a big part of the aesthetic appeal. In the first 350cc T-bird, the archaic AVL engine had been somewhat of an eyesore. This was thankfully revised when the AVL was swapped out for the Twinspark UCE mill in 2008. Four years hence however, the design gurus at RE have taken a very different approach with the fuel-injected 500cc UCE motor that has been plonked into this new T-bird. Gone is that dull aluminium finish, replaced by a full matte black treatment to the crankcase while the block features a similar flat black finish, albeit with buffed edges on the cooling fins. The result is absolutely stunning and vastly reminiscent of what you find on some of the Evolution engines on the Harley-Davidson Sportsters. The fuel tank has also been enlarged, and while we shall discuss the benefits of this a little later, combined with new engine design, it gives the bike a much more muscular stance. Then there are all the little details such as the new projector assembly housed inside the main headlight, the new blue backlit meters with a tacho as well as an LCD display, the split seat, new smaller indicators, redesigned rubberised footpegs, a new LED tail lamp assembly, a completely redesigned exhaust pipe... the list is rather endless. And in the classic case of “You can have it any colour as long as it’s black”, the Thunderbird 500 is offered in three shades of black, which normally would’ve been a major downer, but in combination will all the new bits, the end result is quite impressive. At the heart of this beast is the 500cc engine that we first saw on the Classic last year. This air-cooled, 4-stroke motor uses a twin sparkplug setup and as is the tradition in all Royal Enfield motorcycles, features pushrod driven overhead valves. Just like in the Classic, carburetion is via an electronic fuel injection, which for the Thunderbird 500 has been retuned for even better throttle response through the rev range. In terms of power output, not much has changed with this engine pumping out 27.6 PS of power coupled with 41.3Nm of torque. Even the 5-speed gearbox seems to have gone under the hammer in the sense that shifting cogs no longer requires the use of one. In our performance test, the figures reflect that the Thunderbird 500 (Read : Royal Enfield Thunderbird 500 First Ride) does the dash from zero to 100km/h in about 12.5 seconds, which is nearly a second and a half slower than the Classic 500. This is evident even while riding the bike without any fancy test equipment. The T-bird lacks the neck-snapping acceleration of the Classic and instead seems to have been tuned for better response through the rev range. There is a continuous surge of torque available the moment you open the throttle continuing on almost till you reach the redline. This means that in-gear acceleration is where the T-bird really excels, with the 30km/h to 70km/h run in fourth gear dispensed off in just 8.72 seconds. Eventually it will hit a top speed of nearly 130km/h, but high speed bursts aren’t really the T-bird’s forte and its happiest singling along at 80-90km/h. Shedding off all that speed however isn’t as easy as gaining it. Even with a 280mm disc with a twin-pot calliper at the front and a 240mm disc with a single pot calliper at the back, this nearly 200kg machine takes its own sweet time to slow down. The braking isn’t what you might label bad, but the problem lies more in the feel of the brakes, which is rather vague. Now I’ve always been a huge fan of how the Classic or Machismo tackled the twisty stuff but not so much the way the original Thunderbird 350 handled. It wasn’t bad, but just not what you need to carve corners. But nothing could’ve prepared me about the way this new Thunderbird 500 (Read : Royal Enfield Thunderbird 500 First Ride) handles. It is as nimble, if not more so, than the Classic and on top of it, it feels way more planted even through the most high-speed of turns. This new change in the dynamics is thanks in one part to new fatter 41mm forks up front, which really improve the front end stability and feel, even though the front wheel is running a larger 19-inch setup. The other credit goes to the new box section swingarm – a first on any Royal Enfield bike in India. These two factors work together in perfect harmony to create a handling package that one would never expect from a bike which has been labelled as a ‘cruiser’. In fact, the changed handlebar setup also aids in quick changes in direction, while the pegs, which have been moved forward by an inch or so, let the T-bird achieve lean angles the original 350 could only dream of. This might even sound like sacrilege, but I daresay that given a nice set of twisting and turning road, the Thunderbird 500 will even leave the Classic 500 for dead. The only real downside to this handling prowess is the tad stiff suspension setup, which is not ideal for bumpy roads. But I’m sure one can sacrifice some of that razor sharp handling for a slightly more pliant ride if tackling broken tarmac. At its core, the Thunderbird 500 is a cruiser and most of people would believe that the highway is its natural home. 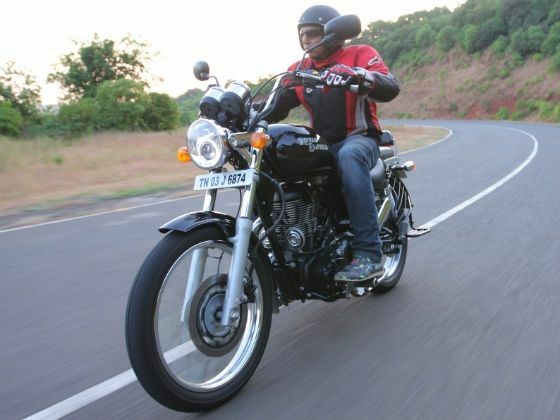 On the open road, the T-bird is a joy as well and at regular highway speeds of 80-100km/h, the bigger powerplant feels very unstressed, with barely any hint of vibes creeping in through the handlebars. Go any faster though, and you will encounter those unwelcome vibrations, albeit mostly through the footpegs. For long highway journeys, the seat itself is fairly comfortable, but for a few, the cut of the back seat does tend to hurt their tailbone after a couple of hours of riding. But this can be easily remedied by chucking out the rear seat to make room for mounting a bag. The bulbous fuel tank of 20 litres is the perfect companion for when on the road and when you consider the overall mileage figure of 37.2 kmpl which we got in our tests (both city and highway combined), it makes for a tank range of 744km! And if you’re mostly going to be on the highway, then expect both the mileage and range figures to rise drastically. The Thunderbird 500 (Read : Royal Enfield Thunderbird 500 First Ride) is a very stunning bike, in every which way. I got on it with a lot of preconceived notions, all of which were promptly shattered in the first 10 minutes of the ride. It is truly a phenomenal machine that now rides very high on my list of not just favourite Royal Enfield bikes, but also my favourite Indian-made motorcycles. It performs brilliantly no matter whether on twisty mountain roads, narrow village tracks or on that long open highway, and I’d highly recommend it for anyone who wants to see India while astride two wheels. Of course, at Rs 1.82 lakh on-the-road in Mumbai, it is not for those on a tight budget. But if it is within your reach, there is absolutely no need to hesitate. Royal Enfield flagship is truly worthy of the title and your hard-earned cash. Share your experiences with Thunderbird 500? Confused about Royal Enfield Thunderbird 500?